Give to the School of Engineering Education at Purdue, and you'll help transform the learning experience of our engineering students and foster the dynamic growth of engineering education as an academic discipline. Each gift to the School of Engineering Education makes a difference. We invite you to join us in achieving our goals by either increasing your current level of annual giving or making an outright gift, planned gift, or pledge commitment. Outright gifts can include property and gifts-in-kind as well as cash and appreciated securities. Deferred gifts can have significant tax and estate planning benefits for you and your family. If you choose to establish an endowment, your gift will be invested in perpetuity, and the annual income it generates will be used to support the university needs you select. Every gift is important in achieving our goals, and we hope you will consider making your gift today! If you would like more information about how your contributions can help the School of Engineering Education, please contact Jeff Anderson, Director of Development. We invite corporate partnerships for specific giving opportunities that offer a range of ways to join our effort to place students, and student learning, first. See Corporate Engagement for details. Purdue Day of Giving is Wednesday, April 24, 2019! Watch for links here! It's crucial to provide today's students a curriculum based on engineering fundamentals and the development of professional skills--and to integrate that curriculum with facilities that are truly state-of-the-art. Our First-Year Engineering Program does just that. In recent years, First-Year Engineering faculty have partnered with corporations and local institutions to bring real, challenging engineering design problems into the classroom. Recent examples of partnerships include Kimberly-Clark, Amazon and Imagination Station. More about First-Year Engineering | The First-Year Engineering program serves about 2,500 students each year, including new students, students transferring from other universities, and students moving from another academic unit at the West Lafayette campus to engineering. The First-Year Engineering Program requires all students take the ENGR 131-132 sequence of courses. Together, the courses cover topics including data visualization and analysis, ethics, engineering design, application of basic programming to the solution of engineering problems, development of mathematical models to solve engineering problems, teamwork skills, and professional communications. Are you interested in learning how to participate with a project idea for First-Year Engineering? You can make a difference! This program brings together multiple disciplinary perspectives at the undergraduate level to equip students as leaders who can address complex global challenges. Authentic project work with industry partners is what helps set our program and its graduates apart. Many “FIRSTS” for our MDE and IDE students created by donors like you! Funded Capstone Design Project | In 2016, we received our first ever Purdue Alumni gift to help fund classroom related prototypes, field trips, etc. Through the generosity of Stephen W. Pater, a new endowment was created to benefit senior capstone design. The Stephen W. Pater Fund for Interdisciplinary Engineering Studies Capstone Class has already provided an opportunity for students to partner with Juno Lighting, our first industry partner, for their senior project. Study Abroad | In the 2016-17 academic school year, seniors participated in the program’s first study abroad trip. They traveled to Melbourne, Australia over spring break. Working with both Art and Industrial Design Engineering teams at the University of Swinburne (Melbourne AU), the students utilized rapid fire, lean design practices to idealize, prototype and pitch their ideas for helping communities in Indonesia deal with recurring flooding in their communities. Students gained valuable work experience in a diverse intercultural context, keeping the white hot pace of an authentic field experience to solve an open ended problem in a unknown setting under extreme time and technology constraints. Are you interested in learning how to participate in a capstone course as an individual reviewer or with a project idea? Want to help with future study abroad opportunities? You can make a difference! Field-defining faculty and gifted doctoral students are pioneering research in engineering education and, through the graduate program, making a significant impact on the nation's science and technology agenda by preparing the next cadre of engineering leaders. ENE Graduate Student Dissertation Research Fund | Many graduate students in the School of Engineering Education carry out ambitious dissertation research projects without the benefit of external (grant) funding. Such projects can place considerable financial burdens on both the student and their academic advisor. Typical expenses associated with such projects include: incentive compensation for research subjects, proprietary survey instrument fees, transcribing of interview data, and travel to study sites (e.g., schools or workplaces). We are initiating an ENE Graduate Student Dissertation Research Fund to provide small grants (est. $500-$1000) to help defray costs associated with self-funded dissertation research. An application and selection process will also be established to direct resources to students who are most in need. The INSPIRE Research Institute for Pre-College Engineering pursues groundbreaking research and innovative programs that inform the development of curricula, assessment instruments, teacher and parent education, museum exhibits, afterschool programs, and STEM education policy within the full spectrum of P-12 engineering education. Additionally, INSPIRE manages the Undergraduate Participation in Research In STEM Education (UPRISE) program that provides the opportunity for a diverse (gender, ethnicity and majors) population of undergraduates to fill integral roles in INSPIRE and ENE’s research projects in engineering education as well as to be given the necessary training, tools and mentorship to conduct research. 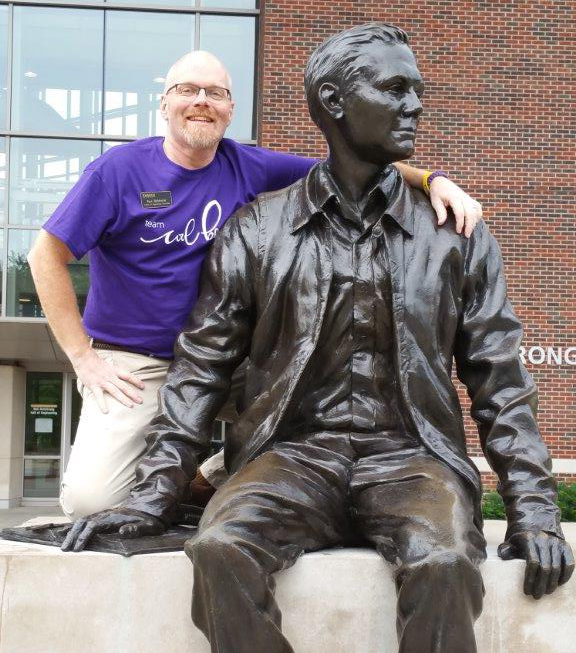 Paul was an academic advisor in the Purdue College of Engineering’s School of Engineering Education from September 2010 until his passing in August 2015. Paul had a passion for guiding young people along their path of self-discovery and personal and professional development. 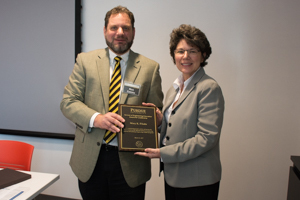 Faculty, staff, and students of Purdue were deeply touched by Paul’s commitment to the development of all people and created an endowment in his honor to further his initiatives. The income and interest from the endowment will support professional opportunities for academic advisors in First-Year Engineering. Such opportunities include participating in local and national conferences that provide tools and techniques for important topics like underrepresented student support, student retention, and trends of student behaviors. The takeaways from advising conferences provide our academic advisors with the tools, resources and support to help each student have the best possible First-Year Engineering experience. Last year, the members of the Engineering Education community created an endowment in Dr. Radcliffe’s honor and it was his wish that the income from the endowment be used to support Leadership and Professional Development for faculty and staff in Engineering Education. Our first community member to receive the award for the 2016-17 academic school year was Mary Pilotte, Director of Undergraduate Programs.